The name Ashton derives from Old English and means the "farmstead where the ash-trees grow"; it is a common name and is found locally in Ashton-under-Lyne in Tameside and Ashton upon Mersey in Trafford. The town's name was recorded as Eston in 1212. Later, the suffix "in-Makerfield" was added, which relates the name of the old district of Makerfield of which Ashton was a part; Makerfield derives from the Celtic for a wall or ruin and the Old English word feld, meaning "open land". St Thomas' Church of England parish church on Warrington Road has ancient origins although the present building is barely over 120 years old. The graveyard is the resting place of many of the 189 victims of the Wood Pit explosion (at Haydock on Friday 7 June 1878), the worst coal-mining disaster in Lancashire at the time. Hope Church on Heath Road was founded by Protestants from St Thomas' opposed to the High Church ideals brought in by a new Vicar in the 1880s. His introduction of Anglo-Catholic worship caused riots on Gerard Street and he was initially evicted from the town by a mob of miners. He returned backed by troops from Liverpool. Banned from worshipping in the form they had always done, many left and continued a simpler form of worship in a barn off Ashton Heath. Word of their plight reached a Miss Catherine Cave-Browne in London who sent money for a Protestant Mission to be built. The church was built with the official title of Cave-Browne Protestant Institute (Christchurch). Park Lane Chapel (see Unitarianism), Wigan Road, Bryn, dates back to 1697, although its congregation was founded in 1662. It is the oldest non-conformist chapel and congregation in the district. By the 19th century Park Lane was only one of nine non-conformist chapels in the area. There was a Baptist, Congregational church (Hilton Street), Evangelical (Heath Road), Independent, Independent Methodist (Downall Green Road), Primitive Methodist, Welsh Wesleyan Methodist and English Wesleyan Methodist chapel. The Catholic Church of St Oswald and St Edmund Arrowsmith, constructed in 1935, houses the hand of St Edmund Arrowsmith (1585–1628). Ashton-in-Makerfield was part of the St. Helens Area of the South Lancashire Coalfield. The St Helens Area lay to the South West of the Wigan area and occupied around 60 square miles (160 km2), skirting Wigan, Warrington, Widnes and to within eight miles (13 km) of Liverpool. In 1867 there were 13 collieries in the district of Ashton-in-Makerfield. Others followed including Bryn Hall Colliery, owned by Edward Frederick Crippin, the Mains and Park Lane Collieries. Park Colliery and some of those open in 1867 (e.g. Garswood Hall) remained productive until the 1950s. A number of Ashton's coal miners made a significant impact on modern British history, including: Stephen Walsh M.P. ; William Kenealy, V.C. and Lance-Corporal in the 1st Lancashire Fusiliers; and Joe Gormley, President of the National Union of Mineworkers in the 1970s and 1980s. In the late 19th century, the district was described by one observer as having "extensive collieries, cotton mills and potteries", and famed for the manufacture of "hinges, locks, files and nails". Mills such as the Record Mill (Spinning), situated in York Road, and the Makerfield Mill (the 'Weaving Shed'), in Windsor Road, took over from home-working. Similarly, Thomas Crompton & Sons in Gerard Street, which would eventually employ around 1,200 workers, superseded the subcontracting system that sustained substantial numbers of locally based blacksmiths and other craftsmen. As recently as the 1970s the district of Ashton-in-Makerfield had one of the highest proportions of derelict land, mainly in the form of spoil tips, left over from coal mining. Major land reclamation schemes have since completely transformed the area. Before 1894 Ashton-in-Makerfield was a township in the parish of Winwick, part of the West Derby Hundred of Lancashire. By an Act in 1845 and the division of the Parish of Winwick, Holy Trinity Church, Downall Green, was made the principal parish church and St. Thomas' made a parish church in the same Act, both being part of the Diocese of Liverpool. By the Local Government Act 1894 Ashton-in-Makerfield was made an urban district. In 1974, under the Local Government Act 1972, the district was split administratively with Seneley Green Parish, containing Garswood, Pewfall and Downall Green, going to the Metropolitan Borough of St Helens in Merseyside, and the rest going to the Metropolitan Borough of Wigan in Greater Manchester. The section of Ashton-in-Makerfield within the Metropolitan Borough of Wigan creates the Bryn & Ashton Township, consisting of the six 'neighbourhoods' of Bryn, Ashton, Ashton Heath, Landgate, Stubshaw Cross and Town Green, and one of the ten areas into which Wigan Metropolitan Borough has been divided for consultation purposes. Each township has a forum, with some influence over the provision of municipal services. Ashton-in-Makerfield consists of the following sections. Town Green, Stubshaw Cross and Bryn, with Garswood and Downall Green in the Parish of Seneley Green. The west of Ashton-in-Makerfield is part of St Helens, in Merseyside. 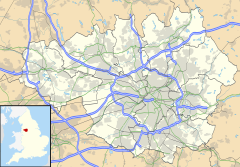 The east section lies in the Metropolitan Borough of Wigan, in Greater Manchester. It is included in the Liverpool Built-up Area a term used by the Office for National Statistics. Ashton-in-Makerfield railway station, which was situated off Lodge Lane in neighbouring Haydock, opened in 1900 as part of the Great Central Railway and closed in 1952. The town is now served by two stations, Bryn railway station and Garswood railway station, both on the line between Wigan North Western railway station and Liverpool Lime Street railway station. Bryn station is closer to Ashton than other stations in the United Kingdom which have been (and are) "labelled" as serving their towns, such as Tring railway station which is between one-and-a half and two miles from the centre of Tring. A market is held on the market square off Garswood Street on Tuesdays and Saturdays. Ashton's local semi-pro football clubs are Ashton Athletic F.C. and Ashton Town A.F.C.. Garswood United F.C. is also nearby. Crompton's, the hinge and fasteners making factory in Ashton-in-Makerfield, has closed and is now demolished. A shopping centre called the Gerard Centre now stands in its place. The Hingemaker's Arms public house, on Heath Road, is the only one in the world known to carry that name. It was run by the Corless family for decades until Walter Corless' retirement in 2006, however Walter can still be seen pulling pints at the weekend. The Hinge, as it is known by its clientele, is now owned and operated by a consortium of local businessmen. The site now occupied by Byrchall and St Edmund Arrowsmith high schools was the location of a Second World War P.O.W. camp, Camp 50. Ashton-in-Makerfield has three secondary schools: Cansfield High School; Byrchall High School and St Edmund Arrowsmith Catholic High School. In November 2008, Wigan council released proposals to merge Cansfield High and Byrchall High into one school. Les Hart, footballer and football manager, born 1917. Served Bury Football Club in several capacities starting as player and club captain, for 44 years. In 2010 Bury F.C. renamed their south stand at Gigg Lane the Les Hart Stand in his honour. ^ "Town population 2011". Retrieved 9 January 2016. Wikimedia Commons has media related to Ashton-in-Makerfield.